27 reach beyond simple classification. 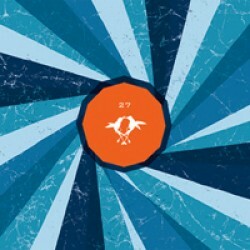 Combining bits and pieces from indie rock and trip-hop, as well as post-rock and traditional emo, 27 creates their own distinct sound within the teeming indie rock scene. With an EP, full-length, and a notable guest appearance (Isis - Oceanic) under their belts, the band has been together long enough to mold themselves from their diverse backgrounds into a well organized song-writing unit. With the utilization of lo-fi recording, 27 draw the listener in before they know what's come over themselves. The album kicks off with "The Cause," which is the most rock oriented song on the EP. The central component of the song is Ayal Noar's guitar-work, which is quite similar to later Neurosis material, but with less distortion. Vocalist Maria Christopher melodies and honest lyrics are quite infectious; before you know it you are singing along with the chorus. As we move onto the second track, "Every Day," the guitars take a backseat to the smooth fluid drumming of Neil Coulon, who is very proficient throughout the album. It is here that we hear Christopher show off her beautiful and poignant lyrics, evoking emotions that tell a story through the variations in her harmonies, as well as the lyrics. 27 switch things up on "Make Love Not War," demonstrating their versatility and numerous influences. This track and the subsequent one are dark and gloomy indie pop songs, yet they also hold aspects akin to trip-hop in the use of a drum-machine. With the use of an organ on "Try (Part 2)," 27 further add to the somber emotions that are stirred up over the course of this album. Aside from the opening track, Naor's guitar playing is very reminiscent of Sonic Youth and Slint, and even emo outfit Mineral. 27 further explore the post-rock/math-rock genre on the instrumental interlude "The Light." On the albums final track, "April," we are treated to a guest appearance by Jeff Caxide and Aaron Turner, both of Isis fame, as they provide back up vocals for the conclusion of Let The Light In. Throughout their latest release, 27 flaunt their willingness to not be pegged as one-dimensional. In their eagerness to explore so many genres, the album can spread a little thin. In addition, some of the songs are a bit underdeveloped and end without warning. In the end you are left with a nice collection of sincere organic indie rock that is pleasing to the ear, especially if you're in the mood for some nice chill music. Posted April 5, 2004, 4 p.m.